How tidy is tidy enough? I’ve been seeing some buzz about a book: Marie Kondo’s The Life-Changing Magic of Tidying Up: The Japanese Art of Decluttering and Organizing. Modern Mrs. Darcy covered it; she’s a fan of the folding method. Laura Vanderkam suggested not cleaning up can be a more useful philosophy. Nicole and Maggie mention an earlier post questioning the wisdom of raising children to feel stressed out by clutter. I love a good organizing book, but I haven’t read Kondo’s book yet. I may. We’ll see. As I try to assimilate our lovely Christmas gifts into our home, I’ve been thinking about stuff. And cleaning. New year, new start, right? For me, there are two separate issues here. Tidying involves moving around things. Cleaning involves removal of dirt and grime. On the tidying front, we did a lot of “de-owning” before our move to Italy. I read Joshua Becker’s Clutterfree with Kids an at opportune time. He stresses de-owning possessions over organizing them. If you are organizing things, it is just a shell game. You are still spending energy on cleaning, maintaining, and housing the things. It is better to just get ride of them entirely than to be beholden to your things. I like this idea. We really don’t need that much stuff. I rotate toys to keep from being overwhelmed by them. I’ve embraced minimalist dressing and should really purge my closet again. James cut back on clothes and has expressed enjoyment at having a well curated closet full of things he likes. We still have more stuff than we need, but I like the idea of only keeping around things you need and like. Kondo suggests you should not keep things unless they “spark joy.” I get that. On the cleaning front, I’m all over the place. We still don’t have any cleaning help. In the early days here, I had a daily schedule together. I cleaned about 20 minutes a day, and I felt like we were on top of things. Then life happened. We spent more time seeing friends and getting out of the house. This is a good thing, but it made chores harder. I refuse to do chores when the kids are napping. The chore window feels limited. I’ve also let it go. Kitchen and bathrooms get special attention. I find that doing a little bit daily or weekly makes a big difference. If I clean the bathrooms once a week, I can do it in 15 minutes. (Does not include floors. Or mirrors.) If I wait, the stuck on grime starts to feel insurmountable. I really need to work on the floors more. The baby is not yet crawling, but the kids live on the floor. But I don’t need to vacuum every day. My general cleaning philosophy is to be clean enough that things are sanitary and you wouldn’t shy away from an unexpected guest. And for me, this is where tidying and cleaning intersect. I think cleaning is easier to do if things are generally tidy. Right now I really need to vacuum the rug, but the kids toys are all over it. Kitchen counters are a lot easier to wipe if they are clutter free. I think my more militant cleaning schedule worked in the early days because all of our stuff hadn’t shown up yet. I’m still trying to find my groove. 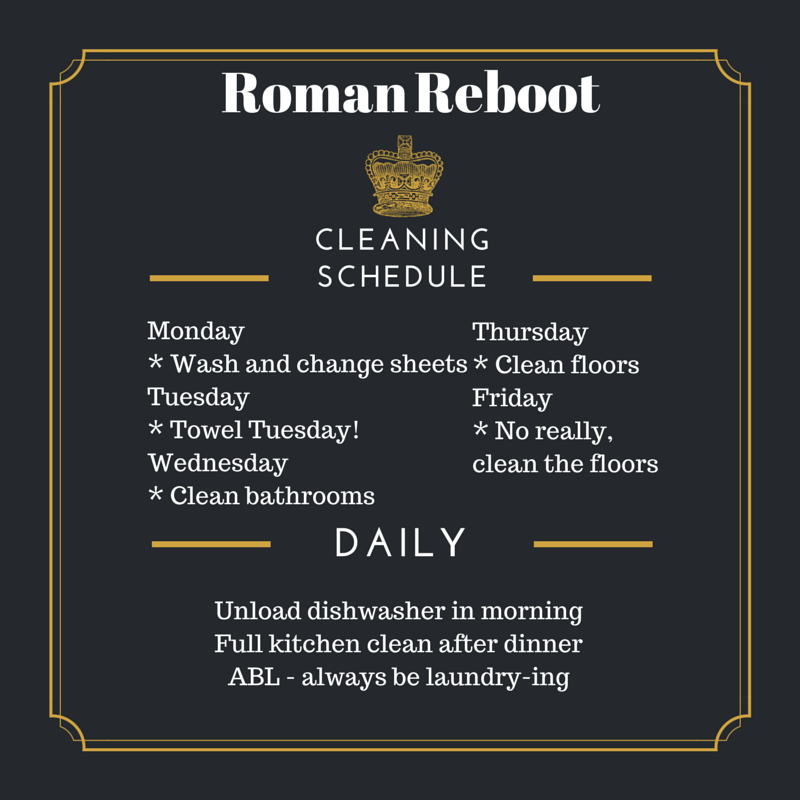 I came across this cleaning schedule printable while reading this awesomely interesting article on following Pinterest’s most popular for a week. Nothing on here is mandatory, as you would know by the current state of my floors. ABL – always be laundrying is an important tenet. Our one floor dwelling has made laundry much easier. I don’t really mind laundry except the putting clothes away part, which I suppose is sort of like saying that you don’t mind marathons except the running part. And please don’t think I’m doing this alone. James does 99% of the after dinner clean-up, trash/recycling removal, and more. But as you can see, a lot doesn’t get done. Dusting is rare. I haven’t cleaned any ceiling blades or windows. This is mostly working for us for now. At least until our next change in schedule anyway! Mac already seems to be dropping his morning nap . . .
Do you have a cleaning schedule? I’d love to hear! What is your mess tolerance? Have you noticed a correlation between amount of stuff and ease of cleaning? Before our last move, Jeff had a very long commute and worked a very irregular schedule with lots of overtime. So the cleaning plan was that everyone would load and unload the dishwasher and do laundry as needed, and I would periodically clean the whole place while I was home alone at some point. After the move and job changes for both, I have a moderate commute, and he’s the one who’s most likely to be home alone. He proposed a cleaning strategy, and we’ve actually stuck to it for almost 2 years now. The schedule is Monday: kitchen, Tuesday: bathrooms, Wednesday: spare bedrooms/offices, Thursday: living room, Friday: master bedroom/catch-up, Everyday: dishes (no dishwasher, we’re brainstorming solutions to this, but kitchen space is limited), As needed: laundry. There are several things I hate about this system. The greatest drawback for me is the redundancy. It pains me to make a bucket of mop water and not do all of the mopping knowing that I’m just going to pull out that bucket tomorrow. Same goes for dragging out the vacuum cleaner or the duster. On the other hand, floors are actually getting mopped, and things are getting dusted, often not by me, so maybe it’s time to get over it. As for clutter, we try to replicate the “a place for everything, and everything in its place” strategy that we use on research vessels. When new things come into the house, they need a home, not to just get stashed somewhere.